I’m on Instagram and Goodreads – Bombard the Headquarters! 1. I haven’t written any posts for this platform for some time due to the volume of other writing I’ve been doing lately. I am now much more active on Instagram where it’s just a matter of taking snapshots on the smartphone and write short captions. I’ve also returned to regularly updating my Goodreads where it’s really no effort to put starts on books I’ve read. I am of course also in Facebook where I interact with family, comrades, and friends. 2. Trying to raise a little baby into girlhood with Sheila and taking a shot at graduate studies at the university has taken up much of my time this past two years. Apart from freelance jobs that makes me part of the so-called “precariat”, I’m also somehow helping out the progressive group Anakbayan. 3. I have completed my coursework with the M.A. Araling Pilipino (Philippine Studies) program at the University of the Philippines Diliman College of Arts and Letters and will proceed with thesis writing already (updated as of June 2018). My reading and writing interests lean towards historical materialist investigations of revolutionary literature and alternative journalism, Philippine social movements, and media and cultural studies. 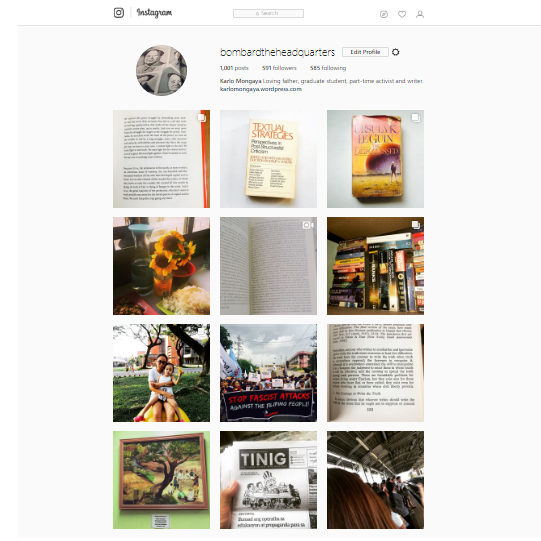 Pingback: Libraries I (Diliman) – Bombard the Headquarters!